Condo Studio, 1 lit Queen, 1 salle de bain, Internet, Parking, sommeil 2-3 personnes. Le Fairway Villa est situé à l'angle de Ala Wai Boulevard et Wailani Street, à seulement 2 pâtés de maisons de la célèbre plage de Waikiki. Le bâtiment offre 365 condos sur 29 étages. Mon condo est situé au 23ème étage. Je récemment rénové l'appartement complètement et je suis heureux de l'offrir à mon avenir invité. Comme indiqué sur mes photos, le condo est meublé avec goût avec tous les conforts de la maison. Le condo est climatisée, dispose d'une télévision par câble de base sur un 'TV Plasma 32, Internet sans fil, interurbains gratuits, y compris la partie continentale des États-Unis et au Canada ainsi qu'un parking gratuit. Le condo a une laveuse et une sécheuse aussi, baignoire et douche à la fois dans la salle de bains. Le réfrigérateur dispose d'une machine à glaçons et tous les appareils sont neufs comme d'Octobre 2010. Le toit dispose d'une piscine, sauna et jacuzzi. Il ya aussi un barbecue sont sur le toit ainsi pour les clients puissent en profiter. Vue imprenable sur l'océan et la vue montagne et la ville. Le Fairway Villa est un immeuble sécurisé avec 24 heures de sécurité. Nous sommes à quelques minutes de shopping, le marché international, les restaurants ainsi que d'autres attractions touristiques de Waikiki. Nous sommes à 1 pâté de maisons de la ville arrêt de bus qui vous emmène partout sur l'île. Le Fairway Villa est un bâtiment sans fumée. We had a great time. It was very comfortable. Perfect location - Secure bldg-great parking - nice apt - would book again! Owner very responsive! Worked perfectly for us. The inside parking being included was great as we had a rental car. Convenience of kitchen allowed us to enjoy breakfast without having to go to a restaurant. Great VRBO experience! I was very impressed with this unit and Budi was great! We couldnt have asked for a better unit and owner. We wil be staying here again on our next visit. Perfect location, washe dryer and FREE parking. Walking distance to the beach. Perfect view from our balcony. Beach and Diamond Head are visible. Highly recommend this condo! Clean, gorgeous views, great location! My new husband and I stayed 13 nights here on our honeymoon. It is exactly as pictured and the location was even better than we expected! The view from the 23rd story balcony is AMAZING - looking out over the canal and golf course to the left, tall buildings in front of you, and the ocean to the right. It is shaded in afternoon/evening and gets a nice breeze. You also have the roof top with lounge chairs, pool and hot tub, and barbecues with amazing views all directions! It is perfect for 2 people, not much extra space but it was plenty big enough for us. Some have said there's no room for luggage but we lined up our suitcases in the entry hall which worked great. The bathroom is tiny but adequate. The washer and dryer is a definite bonus for extended stays, as is the included parking space which is hard to find many other places! It is in easy walking distance of almost anything in Waikiki, and if you don't feel like walking, taking an Uber is very cheap since it is such a short ride. If you have a rental car and want to spend time on Waikiki beach, I suggest parking at the Ala Wai boat harbor in front of the Ilikai hotel - parking is only $1 per hour and it is right next to a stretch of beautiful sandy beach for hanging out on and swimming in the ocean. Great spot for watching the Friday night fireworks also! Highly recommend this condo and would definitely stay here again! Perfect location, clean, we loved it. We stayed for 10 days at the condo. Budi assisted promptly whenever I had any questions. Condo is in a perfect location, minute walk to beach and restaurants. Included parking spot was a bonus as was the washer and dryer in the room. I travelled with my husband and 18 year old daughter. A bit tight for 3 people though it was just a place to sleep. We managed with all our clothes by double and triple hanging in the closet. There were lots of hangers. There is a chest of drawers though it didn't fit all the clothes we brought..... we managed by hanging a lot in the closet. A handle on the chest of drawers is broken right off which made it difficult to open....I'm sure Budi will have this replaced asap. We highly recommend this condo. This is our first time using VRBO and it was a great experience! Thank you Budi!! We loved it. 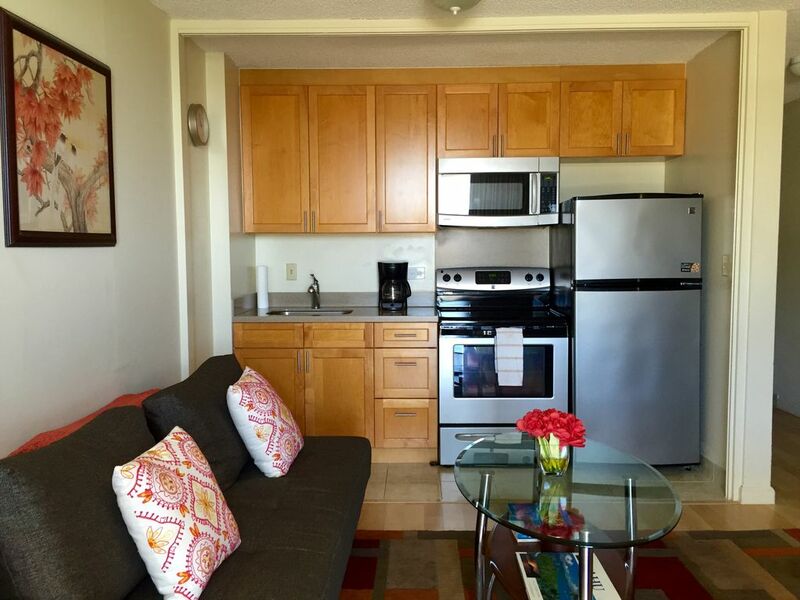 The condo was very clean, comfortable and centrally located. The property as a whole was fantastic. Love the rooftop pool. The 24/7 security of the building is a real plus too. We are already planning our stay for next year and we can't wait. ABOVE RATE IS BASED ON DOUBLE OCCUPANCY (2 ADULTS). MAX - 3 ADULTS. FOR OCCUPANCY 3 ADULTS -- PLEASE ADD $15 ADDITIONAL CHARGE PER NIGHT.